The 2004 Tour de France is meant to be an on-the-edge-of-your-seat route. It does not favor our Lance Armstrong, but is meant more for an all-climber type. It does not have a long time trial (TT) prior to the mountains, which Lance has in the past dominated, and in the team time trial (TTT), the maxium a team can lose is 2:30, no matter how bad they are so that they are able to get the yellow jersey. Lance has a good team for the TTT and is the favorite to win as they won last year, and ONCE (now Liberty Seguros), their greatest rival, in it isn't as good as they used to be (they finished third in 2003). 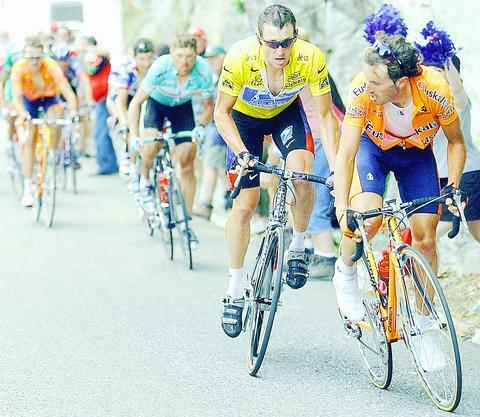 In 1999 or 2000, Lance gained 4 minutes with the TTT on his greatest rival. So for the overall classification, we have Lance Armstrong, the five-time Tour winner; Jan Ullrich, the five-time Tour runner-up (and won in '97); Tyler Hamilton, who placed fourth last year with a broken collarbone, and Iban Mayo, the Basque that won on Alpe d'Huez last year and has made life difficult for Lance in pre-Tour races both this year and last year. Some other possibilities for podium places are Haimar Zubeldia, which came in fifth in front of Mayo last year, and is on his team, and Roberto Heras, which was on Lance's team starting in 2001. From right to left, that's Iban Mayo, Lance Armstrong, Jan Ullrich, Jose Luis Rubiera, and Haimar Zubeldia. Key stages are: the stage to La Mongie, the Alpe d'Huez TT, Plateau de Beille, and the final TT in Besancon. For the King of the Mountains competition (KOM), the favorite is Richard Virenque that won 6 times already and is aiming for a record-breaking 7th title. Allesandro Petacchi should be a good rider in the sprinter's competition, which he won in the Giro d'Italia along with a record-breaking eight stage wins. Good overview. I am going to watch the OLN show tonight. Thanks for the information.